Paisley Pants from Sascha's Designs come in 8 colors, a light pack and a dark pack. Each pack of 4 is only L$199. The pant length is modifiable. The jacket and tank are from the Carmen Outfit which includes a matching pants also from Sascha's. Jewelry: Nicole necklace and earrings - GeWunjo. Matching bracelet available. Comes in 6 colors. Buy individually or as a set. Try the demo version available at the mainstore. New Rlease - Discounted until Monday only! and two skirt options: slim (shown) and full ballroom. L$400 each and bonus pack with all gown L$1500 but only until Monday when the price goes up. complete with hair, horns and wings. Spice Tunic Dress from ::Poised:: Black tights included. that I pared with a Page 3 halter dress. Graffitiwear - Open Plaid shirt - Created for men but oh so cute when worn by a woman. They come in blue, green and tan. Only L$50 each. 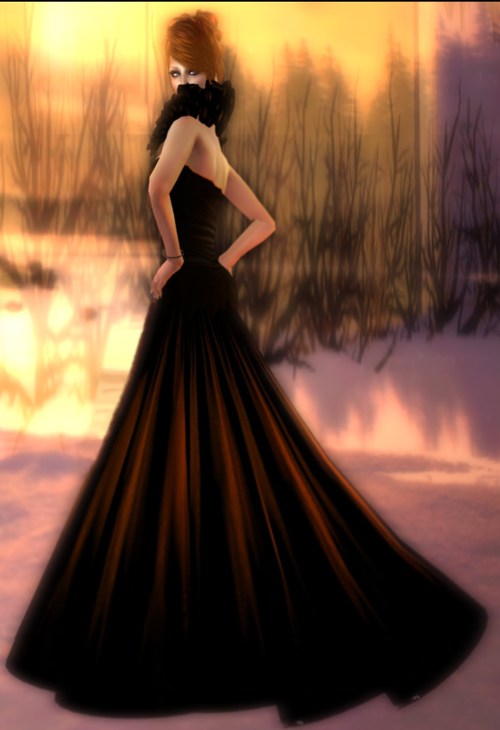 Dress - Cavena Obscura Beach Dress in Sunset. Available in 5 colors and fatpack. Fairy Dress Sky is beautifully textured with graceful movement befitting it's name I wore the long version New Year's Eve and it's quite lovely on the dance floor. Includes both skirts, two layers and and underprim for the long version. From Carisma Creations 2012 Collection.